Study sessions will take place on Thursdays (12 noon to 1:15 pm) on 10/11, 10/18, 10/25, 11/1, 11/8, 11/15, 11/29, 12/6, 12/13, and 12/20. $260/members, $280/non-members. Call the office 718.338.3800 or email office@emjc.org for more information. 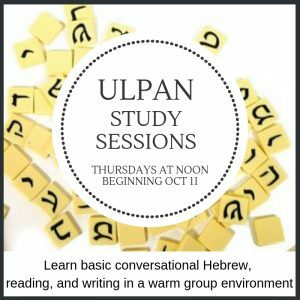 To purchase your tickets via credit card, visit our Square store: https://squareup.com/store/emjc/item/ulpan-study-sessions or bring cash or a check to EMJC on the date of your class.